It's summer time and you know what that means? Time to spread the word about Britain's Greatest Summertime Treat- Pimm's! You might have seen on the shelf in your local grocery store on liquor warehouse and if you haven't actually snagged a bottle to see what it's all about, that's totally understandable. It's not really one liquor or another- it's more of a tonic. Which, of course, makes it a very British thing indeed. Emerging n the mid-1800s, courtesy of a dude named Pimm who was a farmer's son from Kent. He made his 'No. 1 Cup' as a mix of gin and secret herbs and liqueurs and by the 1880s, Pimm had gone from one Oyster Bar to a whole franchise chain of Oyster Houses. 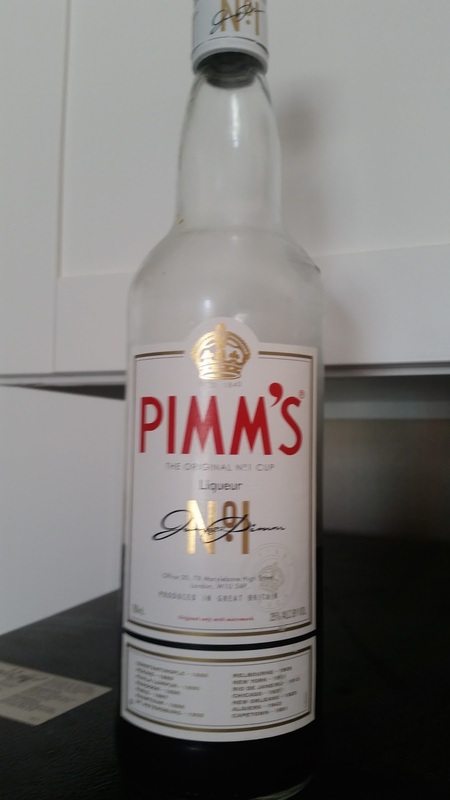 At it's height, Pimm's had not just the 'No 1. Cup' but five other counterparts- including No. 2 (scotch whisky based), No. 3, based on brandy (still sold as the Pimm's Winter Cup), No. 4 was rum based, No. 5 was rye whisky based, No. 6 is vodka based and still around in small quantities. The No. 1 cup has been sold as pre-mixed with Sprite (Pimm's & Lemonade) and has flavored versions featuring strawberry, blackberry and elderflower. Okay, so now that you know what the hell it is, how do you make it? Well, it's easy: take fruit (oranges, apples, cucumber if you want to be super British about it) chop it up, throw it in a tall glass with ice. Add some Pimm's. Top off with ginger ale and/or Sprite and drink. If you want to be fancy and make a Pimm's Royal Cup- add champagne instead. Overall: This is the perfect summer cocktail. It doesn't break the bank, money wise. It's refreshing. And it's versatile as they come. You can mix and match and do pretty much anything you want with it, which makes it a pleasant summer delight. My Grade: **** out of **** Pretty much a must have for summers.